Rhizophagus is the only genus in the subfamily Rhizophaginae Redtenbacher 1845. It currently contains four subgenera: Cyanostolus Ganglbauer 1899 (sometimes recognized as a genus) for the European species Rhizophagus aeneus Richter 1820, Anomophagus Reitter 1907 for three Nearctic and two Palearctic species, Eurhizophagus Méquignon 1909 for one North American and three European species, and Rhizophagus s. str. for the remaining species (Bousquet 1990). The type species is the European Rhizophagus bipustulatus Fabricius 1792. 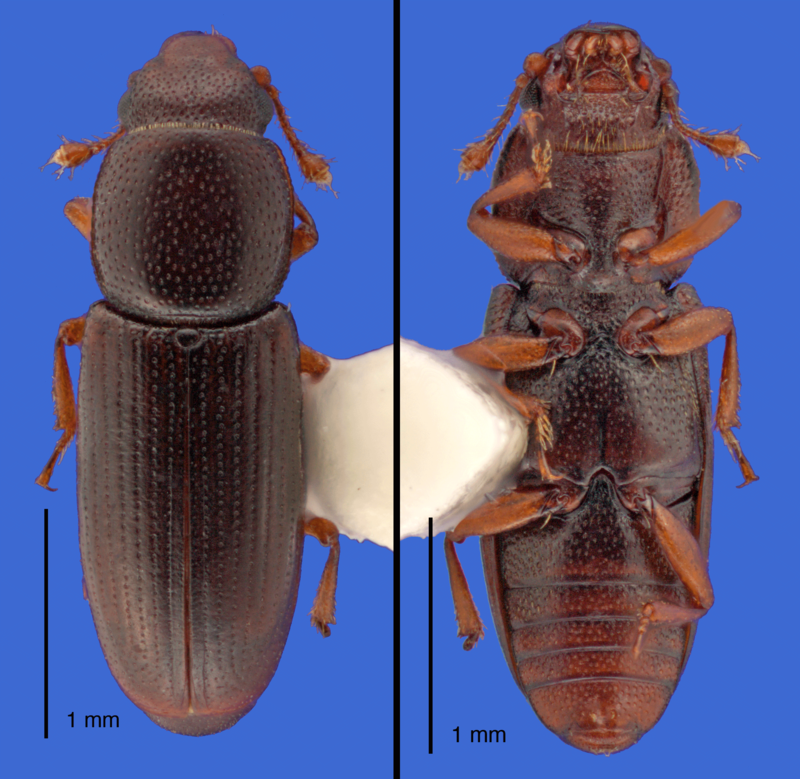 Rhizophagus can be identified with the following characters: fore coxae transverse, fore trochantins exposed, and antennal cavities/grooves present lateroventrally on head. In general, members of Rhizophagus are more elongate/cylindrical and appear glabrous. The antennal club is one-segmented, and in one subgenus (Anomophagus) the true terminal antennal segment is withdrawn into the penultimate segment, giving the club a truncate look. The biology of this genus is the best known of all Monotomidae, however much about the natural history remains unclear. They are generally considered to be mycophagous or predaceous on larvae of Scolytinae (Curculionidae) as either larvae, adults, or both. When predatory behavior has been recorded, it was typically considered facultative; however, one European species, Rhizophagus grandis Gyllenhal 1820, is known to be an obligate predator of Dendroctonus micans (Grégoire et al. 1985), the great spruce bark beetle. Rhizophagus parallelocollis (introduced to North America from Europe), is called the “graveyard beetle” because it is often found associated with recent graves (Bousquet 1990). It may feed on dipterous larvae, but can also be found attracted to other moldy habitats, such as plant refuse, old bones, sap, and many others (Bousquet 1990). Rhizophagus brunneus has been implicated as a vector of a Ceratocystis fungus species that causes aspen cankers in the western USA (Hinds 1972). Ceratocystis has been reared from wild caught Rhizophagus bipustulatus and Rhizophagus dispar (Paykull 1800) and both are often caught in association with galleries of scolytines collected from elm disease-killed trees (Crowson 1984). Thus, Rhizophagus is one of the most economically important genera of monotomids, as both potential vectors of plant pathogenic fungi and biocontrol agents of Scolytinae bark beetles. They are often collected under bark of fallen trees, mainly coniferous (e.g. Abies, Larix, Libocedrus, Picea, Pinus, Pseudotsuga, Thuja, Tsuga), but some species prefer deciduous (e.g. Acer, Alnus, Betula, Castanea, Fagus, Fraxinus, Populus, Prunus, Quercus) (Bousquet 1990). Some species have specialized phenology, flying only in winter or summer months. Rhizophagus is primarily Holarctic in distribution, with some species occurring in the Oriental Region, including the Indian subcontinent and Japan. In the New World, Rhizophagus is restricted to temperate areas of North America. However, a few species can be found in montane regions of the Southwestern USA and as far south as Durango, Mexico (Bousquet 1990).